November 29, 2014. 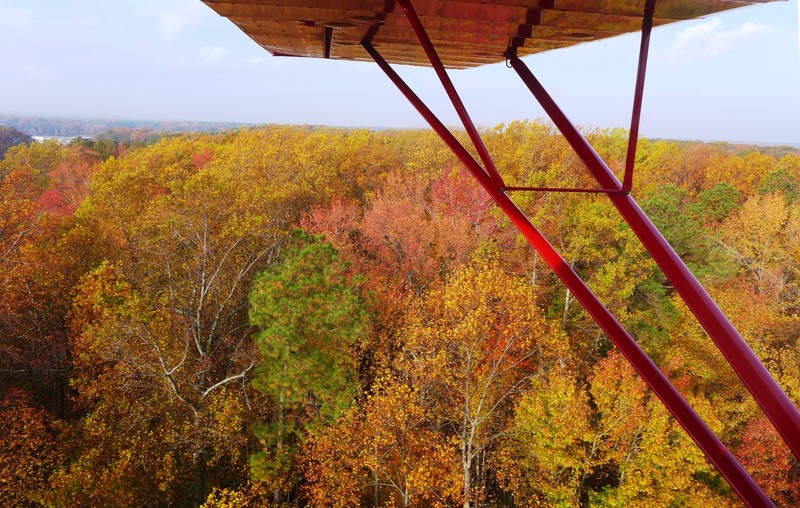 My daughter Joanna came down from New York for Thanksgiving and we went for a morning flight. 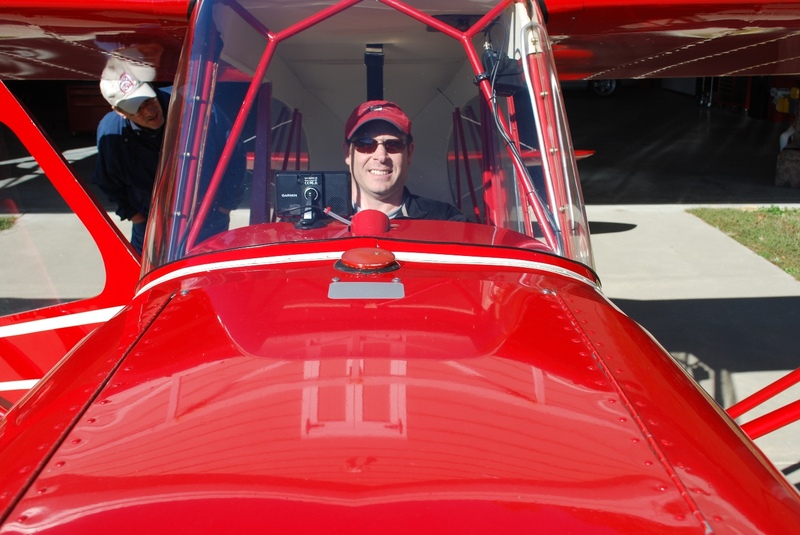 Temperatures were in the low 40's - comfortable for flying yet cool enough for crisp performance. It's beginning to look like winter is approaching as we taxi out. November 16, 2014. Ready to go see the fall colors and go find breakfast. Notice that the wheel pants are off. More photos from our flight can be seen here. November 11, 2014. I can't think of anything better than having "simply up" as a destination. 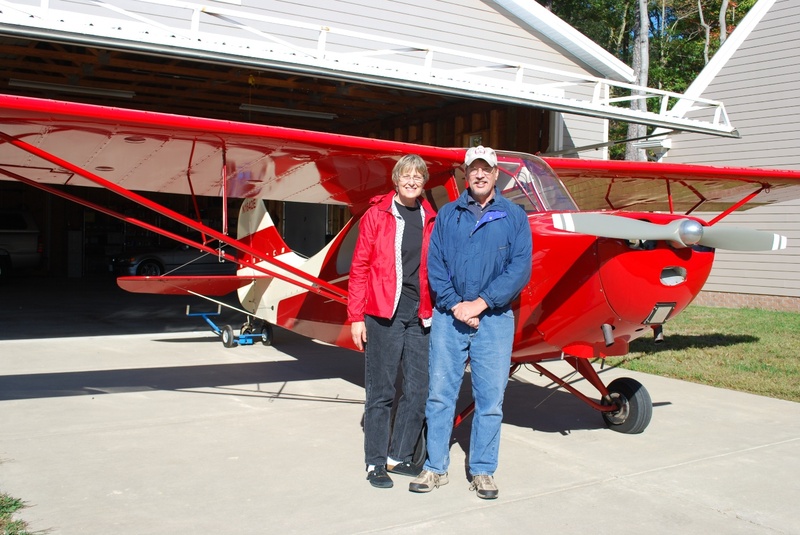 Today I took my wife Sukey up for a flight to view the fall covers in our area. She loves to go up and look around. We recently celebrated our 37th wedding anniversary. Sukey has supported my aviation interest since day one. I'm a lucky guy. Photo on the left (taken earlier) by Scot Shealer , on the right by Sukey Starkey. October 20, 2013. My friend from Frederick, Maryland, Scot Shealer, flew down to visit VA99. Here, he tries out the cockpit of the Champ. Got headroom? Scot is a member of the Sky-Hi Flying Club based at KFDK and flew down with his Dad, Sheldon Shealer, in the club's Cessna Cardinal. Before I moved to Virginia, I was a member of Sky-Hi. 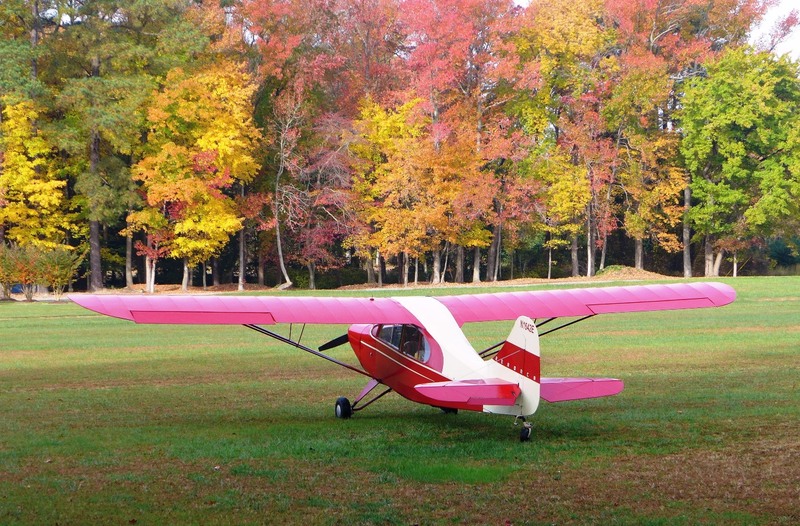 At that time, the club had a C-172. Photo by Sheldon Shealer. June 10, 2013. Not all adventures are of the flyng variety. I enjoy working on the plane. 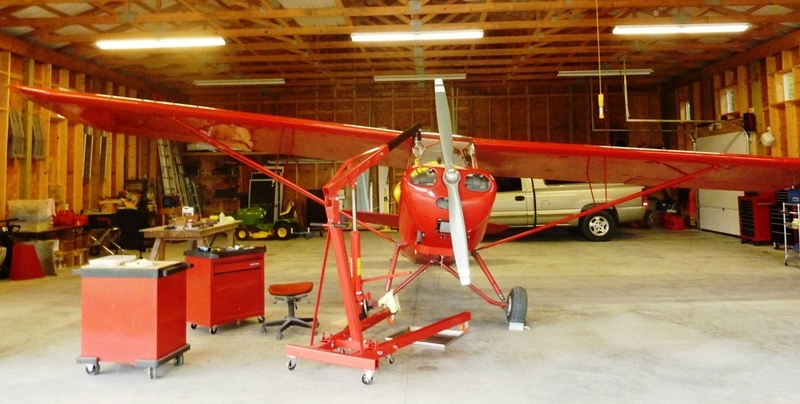 Here, I have used an engine hoist to lift the airframe so I can service the oleo struts. These struts, often neglected on Aeroncas, should be inspected and serviced regularly. 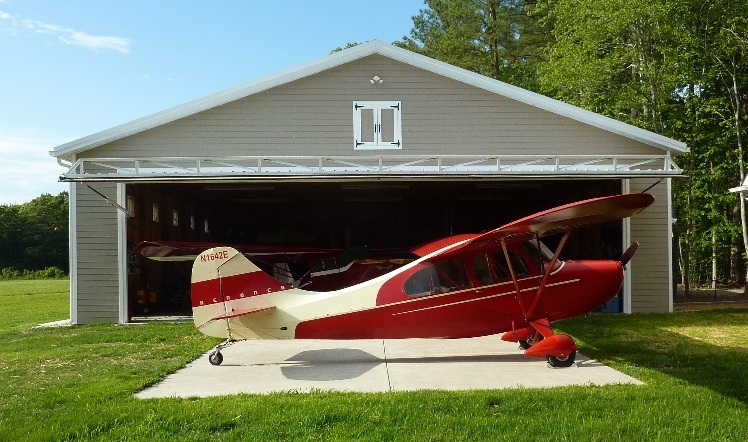 Since this was the first annual inspection since buying the plane last year, I worked with my mechanic to go over the plane very thoroughly from prop to tailwheel. We made a few upgrades, including adding a shoulder harness set and replacing the oil and fuel hoses with new ones covered with fire sleeves. We sent the right muffler out to Dawley Aviation for repair, replaced the tachometer drive oil seal, installed a new carb heat cable and installed a new air filter. I'm fortunate to be able to work under the supervision of an A&P who lives just across the runway. May 15, 2012. 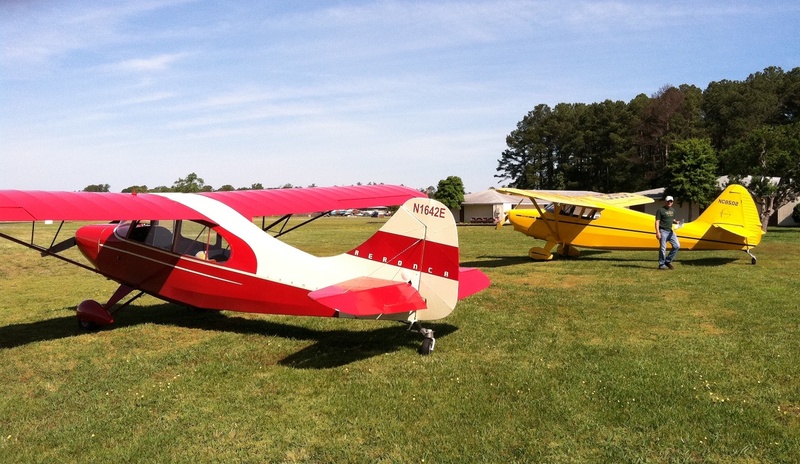 This photo shows off the paint scheme, borrowed from the 1949 15AC Aeronca Sedan. A number of people have commented that the Sedan paint scheme looks good on the Champ. I agree. May 15, 2012. Here's another photo, taken outside of our hangar. May 12, 2012. Photo taken at Hummel Airport, W75, Topping Virginia. 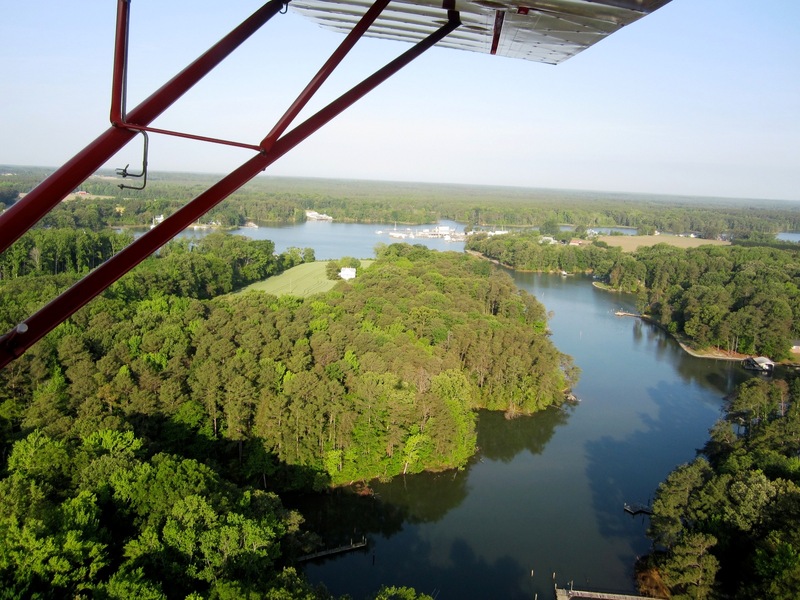 Mike Roe (in the Stinson) and I flew to Hummel for breakfast, then to Petersburg, Virginia for lunch, then with a gaggle of planes from Petersburg to Merlin Aerodrome in Amelia, Virginia. May 5, 2012. On a clear day, we climb out in the Champ over the creek just past the south end of our runway. We have 70+ foot trees at either end of our 2200 foot airstrip. The strong 85+ horsepower Continental allows comfortable operation with two adults. My wife Sukey took this photo from the back seat. April 15, 2012. Today we bought a Champ! 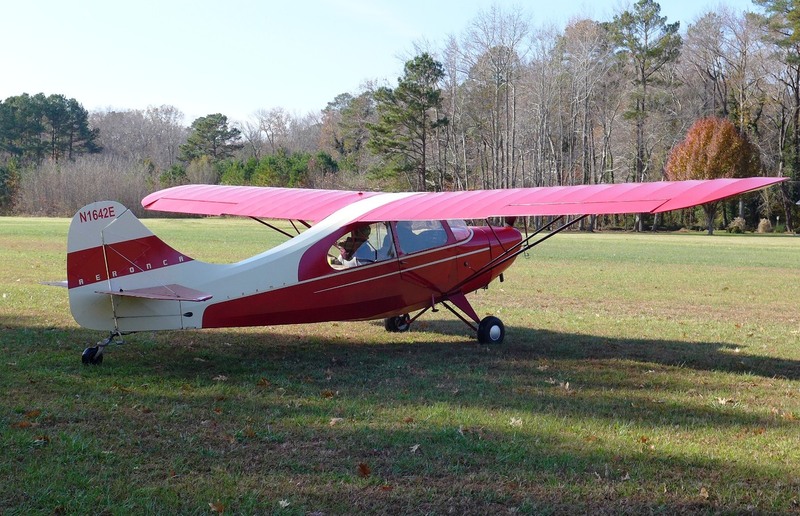 I had admired Frank Isbell's 1946 Aeronca Champ, a frequent visitor to our airstrip, for some time. When he was ready to sell, I jumped at the chance. The C-85 was installed under the Lasher STC. This one has the O-200 "stroker" crankshaft, rods and pistons installed under the Aircraft Specialties STC. It has a Skytec lightweight electric starter. There is no alternator or generator, but a battery powers the starter, a portable Garmin GPS, a portable Icom radio and a PS Engineering intercom. The dorsal fin permits an increase in gross weight to 1300.